Dr. Russell Hemley (CEE) has been invited to join the review board of the Radiation Effects and High Energy Density Science programs at Sandia National Laboratories. He took part in their annual review in Albuquerque, NM, May 15-17. The programs are exploring greater university engagement and interactions. On April 27, Dr. Rahul Simha (CS) received an Outstanding Achievement and Advocacy Award from the College of Information and Computing Sciences at the University of Massachusetts, Amherst, for “impassioned dedication to classroom teaching, educational training of faculty, and interdisciplinary curriculum development.” Each year, the college recognizes the outstanding accomplishments of its graduates. Dr. Simha received his Ph.D. from the University of Massachusetts, Amherst in 1990. ECE graduate student Jordan Moore has been awarded a travel grant from the IEEE Power and Energy Society (PES) to attend the IEEE PES General Meeting 2018. The meeting will be held August 5-9, in Portland, OR. This event is the major annual event in power systems engineering. Dr. Payman Dehghanian (ECE) nominated Jordan for the grant. The Department of Electrical and Computer Engineering has established the IEEE Power and Energy Society (PES) - Industry Applications Society (IAS) Joint Student Branch within the department. The student branch will create numerous opportunities for student members through the IEEE PES and IAS Societies. 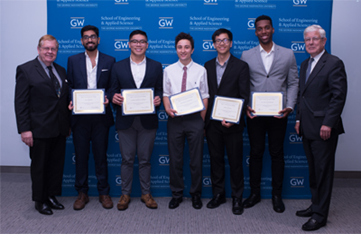 ECE graduate students Bo Wang, Shiyuan Wang, and Mohannad Alhazmi will lead the branch, and Dr. Payman Dehghanian (ECE) will serve as the faculty advisor. IEEE IAS officials will visit the group on June 17 as part of an inauguration meeting. The next offering of the National Science Foundation (NSF) I-Corps AccelerateGW Regional Introductory Course will begin on June 25. This two-week workshop introduces participants to the key concepts and techniques of the Lean Startup method for exploring the commercial potential of new technologies, as used in the NSF I-Corps program. The course requires participants to attend two full-day, in-person sessions in Foggy Bottom and to conduct 20 customer interviews over the two weeks of the course. 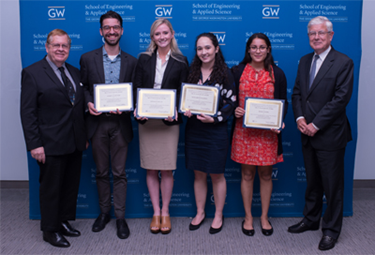 GW teams that are accepted are eligible for a $3,000 grant to cover expenses for doing customer discovery interviews through the AccelerateGW I-Corps Site program. 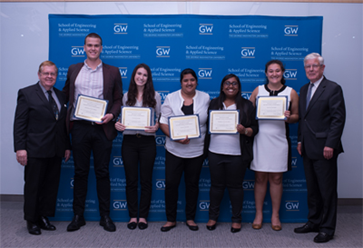 All early-stage technology innovators and entrepreneurs from GW are encouraged to apply. For more information, please visit the AccelerateGW web site or contact Lex McCusker.